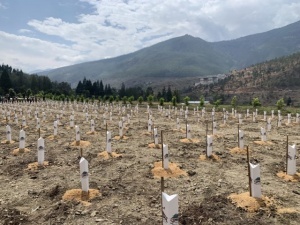 The initial plantings are merlot, cabernet sauvignon, cabernet franc, shiraz, pinot noir, malbec, sauvignon blanc, chardonnay and petit manseng. The vineyards are located at various places around the country to take advantage of the various climates that Bhutan offers and see what works best where. As a mountain country, Bhutan offers a range of elevations - the highest vineyard that will be planted is at 2,700 metres above sea level. Bhutan is a carbon neutral country, known for its sustainable practices and on-track to being 100% organic. So, an interesting experiment in country that has a track record for making peach wines, and western-style spirits in two large distilleries. Strangely, though, there already two red wines that are promoted as "Product of Bhutan" - which are bottled at those distilleries using bulk wine brought in from neighbouring India. It seems as if Bhutan has a bit of work to do on its label integrity. In the meantime, we have to wait five years fro the first release - if there is one - of what Juergens plans to call Thunder Dragon.